Here is a wonderful article, rather video presentations on Yogi Rambhauswami, a 63-year-old yogi who drinks not more than a few drops of water each day and lives on two bananas and a glass of milk for the past 28 years. He sleeps only three hours every night. 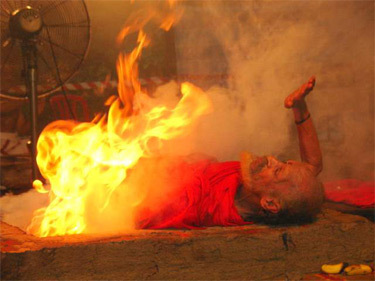 He is the yogi whom fire does not hurt and has mastered the agni tatwa. He begins his ritual by taking a bath, then meditating, doing highly advanced pranayama, honoring Lord Ganesha and finally getting on to the havan kunda in which offerings of rice, coconut, sugar cane, and ghee is made. All ingredients of this havan is mentioned in the video below in Mike Vasan's documentary. Rambhau is humble and down-to-earth yogi, who is open to all questions and even ready to offer himself to research. He does not do all this for any gains but attributes his actions as unconditional offerings of himself to fire for world peace and universal welfare. Have a look at this 47-minute documentary covering all the aspects of it in good clarity. Offering this special treat to all on the siddha path. Stay blessed. Namah Shivaya! Note: Playing all videos at once slows down the buffering.